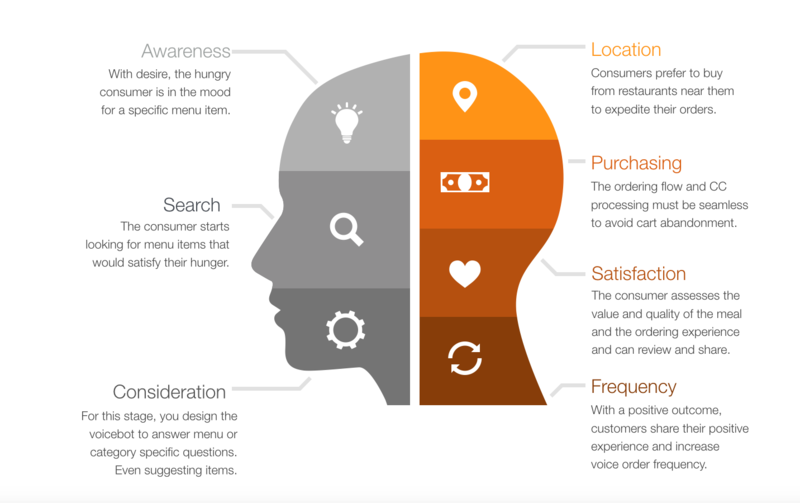 We’ve developed several use cases for how consumers order food. Regardless of the medium, voice is different. In a voice construct, we have to get to the point and be very concise about food item selection. After all, we generally decide what we have a hankering for before we know here to go to feed that hunger. In connection with these learnings, here is a diagram of how we view the voice ordering journey, from a consumers’ perspective. The objective is, or course, to create a superior ordering experience so they will prefer to use their voice and a voice assistant gateway, instead of their thumbs. Then, really cool things can occur, like suggestive ordering, and finally, predictive ordering using machine learning, our proprietary food taxonomy and AI. The Conversational ordering journey begins with desire for a menu category like Indian Cuisine, or a specific food item like Pancakes or Fettuccine Alfredo. Voice-assisted anything is the future of everything. Of course, we’re biased. But, we are also students and teachers at the same time, being totally committed to voice. So, if voice search + commerce is mission critical for the enterprise and the longtail, brands must, absolutely must voice-ready their content. If you’re a restaurant that means get your menu voice-enabled. If you are a retailer, same thing, get your catalog voice-enabled. Modify your keywords on your website to be more applicable to natural language. Un-brand your product names so they can be more easily discovered generically. From “Bob’s fabulous Fettuccine Alfredo” to “Fettuccine Alfredo”. Even better, add a microphone to your mobile app as training wheels for consumers to a more voice-centric e-commerce landscape and economy. We can do that for you! Voice is here today, folks. It’s not some future thing that will just suddenly be everywhere. The metrics are astounding, so I encourage you to search “conversational commerce” or “Voice UI” or “voice ordering”, “voice search”, anything “voice ________” and read, learn. Orderscape is voice-enabling millions of menu items, developing a food-centric taxonomy for a voice environment. That’s a first for the restaurant industry. It’s a huge undertaking and it will pay dividends to us and the industry at large as well as provide a superior consumer user experience when ordering food via Google Assistant, or Alexa. I saw this article and wanted to share it. It’s spot-on about bringing voice to brands with a few tips on where to start. 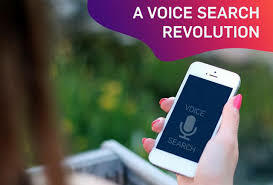 If you are a restaurant brand, call us, we are all-in on voice as a service, for search and commerce.